The 2017-18 season is over for my play-by-mail series. Which has been struggling with branding for a while now but I'll now be calling the P1 series for this post. 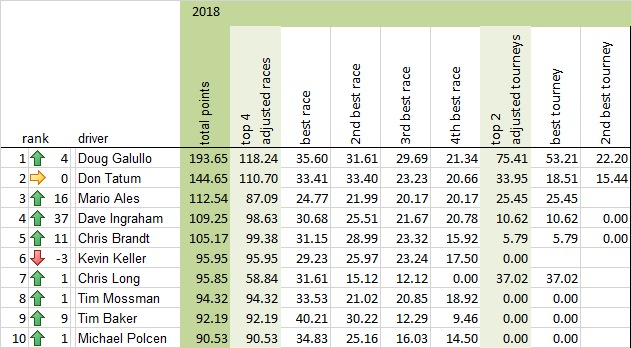 Doug Galullo won the season after winning the 1st two races in the top tier -- coasting to the series win even after finishing last in the final race of the season. Below is the 2nd to last turn of race 2 in Baku. Doug was 4 spaces behind Don and Chris a turn before this image. Going 200, Doug closed the gap through the last corner. Next turn, Doug would push to 220 while Chris L would fail his push to 180 and get beat out at the line. Third to first in the last turn of the race for Doug. Now lets look forward to the next season featuring some changes. First off, thanks to everyone who responded to my survey (See the survey results). Here's the summary of what will be new. No more mid-season demotions or promotions. I was leaning towards eliminating the mid-season driver movement so I was glad to see the survey results agree with me. I think the move from a pure ladder to more of a pyramid structure for the series means that people can move from the bottom to the top tier in a couple season. I also do not like punishing drivers who push hard for a race and crash or dnf. 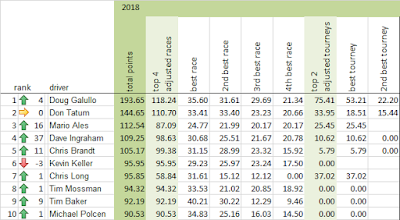 For instance, Chris Long ended up performing very well in the top tier this year but DNF'd the first race of the season. Having 2 races to prove he should stick in the top tier was good I think. You can't line up to give someone else a slip next turn, unless there is another reason to. Those reasons can be many and pretty liberal but there has to be some reason. For the 2017-2018 season, the 3rd tier will stop using knock-out pole bids. The top two tiers may continue to use knock-out pole bids if the drivers and stewards in that race unanimously agree. Since the races do not directly feed into each other this season, I had the freedom to rename the series. The top tier will be named P1 after the series at large. The two second tier series will be named Divoll and Reilly after the co-designers of the original Speed Circuit. The third tier races will be named after old formula greats: Ascari, Clark, Fangio, and Moss. The Driver and Steward line-ups will be announced later. If you would like to volunteer to be a steward, let me know. It is no lie to say that this series would cease to exist without the excellent stewards that sign up for more time, effort, and grief than you'd think. If you want to help out, I will be very grateful. The first race of the season will be Montreal (pdf) -- so sharpen your knives. I will announce race 2 and 3 in the season at later dates. The main reason I delay announcing tracks for this series is that it is the most effective test bed for my tracks. One race of a track in P1 is now 7 play-tests at once. In 3-4 months, the track I most want to validate or test may be very different, so I hold off as long as I can.